When choosing a material for your driveway, there are a lot of things to think about. Your driveway has an impact on your curb appeal and your home’s aesthetic. What may be the most popular option on the market may not be the best choice for you and your home. When properly installed and maintained, concrete will add a lot of value to your home. A concrete driveway shows that you not only work hard, but you also work smart. Though the initial cost may be higher, concrete driveways will pay for themselves with years of low-maintenance service and increased curb appeal. If your driveway is old and needing to be replaced, look towards installing a concrete driveway. Do you want to decrease your carbon footprint? For those who are concerned about their impact on the environment, concrete is the answer. In raw form, concrete is regarded to be a green building material. It takes less energy to make asphalt than it does to make concrete. You can also use concrete from demolished buildings or old driveways and recycle it for your new driveway. Concrete is a very strong and durable construction material. While it may require a slightly higher initial investment, using concrete can actually save you money over time. Asphalt is more prone to deterioration than concrete and requires more repairs and maintenance over time. When installed correctly, the risk of potholes developing is lower. In fact, concrete is one of the construction materials that gets stronger over time. The longer it stays on the driveway, the stronger it gets structurally. You can park heavy vehicles, equipment, or any type of vehicle on your driveway without worrying about the ability of your driveway to handle the pressure. While asphalt may need to be repaired every few years, a concrete driveway will last much longer. When choosing concrete the options are endless. You don’t have to choose a plain boring slab of grey for your driveway. Concrete can be stamped or stained to achieve a variety of different textures, patterns, and colors. 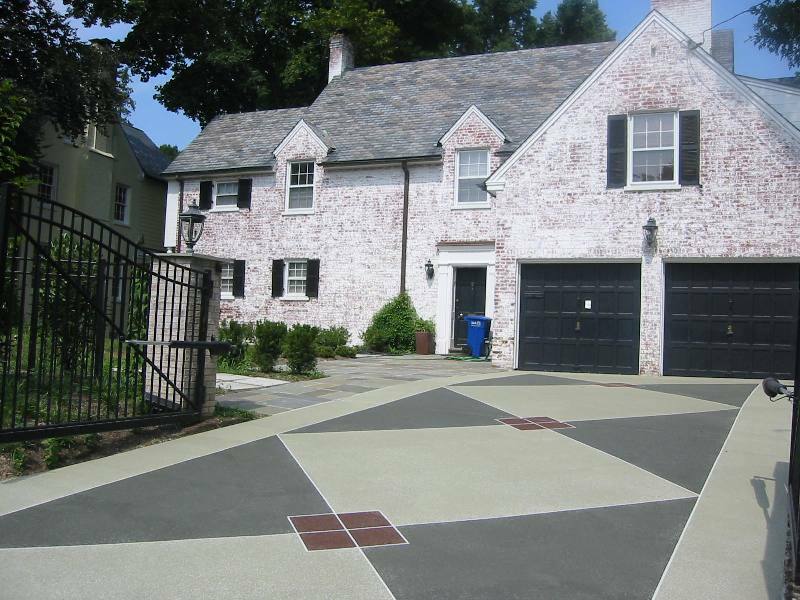 With so many options, your driveway can match the aesthetic of your home or it can be a focal point of it’s exterior. With stamped concrete, you can also mimic the appearance of brick or stone without laying down individual pieces. Concrete requires very little maintenance once it is paved and sealed. Maintenance will merely involve washing off dirt using either pressure washing for large stains or a gentle solution of dish detergent and water. You should also trim the grass off the edges of the paved area when you mow your lawn. Apply a high-quality sealer to all exterior concrete slabs exposed to freeze-thaw conditions whether plain or decorative. The sealer helps protect the concrete from moisture absorption, mold and mildew, exposure to chemicals, and grease and oil stains, keeping it cleaner for longer. Call the experts at Bravo! for all your concrete maintenance needs. Ask about our technologically advanced sealers with Advanced Salt Protection. Protect your investment from oil stains, efflorescence, freeze/thaw and road salt intrusions. These penetrating sealers will strengthen and densify your concrete for many years eliminating sealing on a yearly basis. Bravo! Concrete Maintenance is committed to rejuvenating your outdoor surface from the intruding elements of weather, grime and natural causes destroying its initial charm.